Lawyers and their clients can talk in complete confidence, secure that the law protects what they say from being revealed to anyone. Priests can hear confessions with reasonable certainty that no court and no government will require them to speak of what they hear. But what about people who agree to help scientific researchers? In 1994 a Simon Fraser graduate student faced the threat of being required by a court to disclose information he had obtained in his research on assisted suicide. He had given his research informants a promise of confidentiality. His dilemma, and his decision to refuse to identify his sources in the face of a threat of a court order, triggered a debate first at the university, then across Canada, on the ethics and law of research confidentiality. The examination of this case, and others in Canada and the United States, reveals the complex issues that arise when parties in criminal and civil trials seek to disclose confidential research information. Many professionals -- including journalists, lawyers, social workers, accountants, therapists, physicians, and police officers -- depend on the expectation of confidentiality from people they deal with every day. 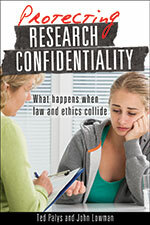 This book provides the most comprehensive available discussion of confidentiality in research, a good understanding of what the law says today, and how it needs to be changed to ensure that the public interest is served.